Murray Douglas (1997 Scholar) thanking Peter Yealand for his hospitality in hosting during the 2016 NZ Biennial Conference. 2016 has been a busy but productive year for Nuffield NZ. The year started with our new 2016 Scholars attending the CSC having attended a briefing in December the previous year. The 2015 Scholars submitted their reports shortly before presenting at our biennial Nuffield NZ Conference which was held in Marlborough. 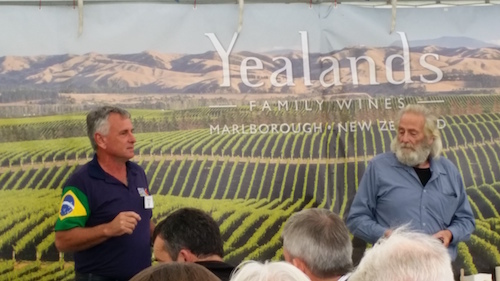 The Conference provided the opportunity to visit some unique farming ventures in the top of the South Island including aquaculture, viticulture, horticulture and pastoral. At our AGM, held in conjunction with the conference, Julian Raine stood down as Chair and was acknowledged for his contribution to Nuffield NZ and International. Juliet Maclean is the new Chair and was quickly introduced to NI by Julian and Jim Geltch. NZ hosted the final leg of the Brazil GFP with a lower North Island program providing a range of farming and agri-business visits in April. The Scholars were also able to share some time with the Kellogg Leadership Programme attendees who were in Wellington at the same time. Applications for 2017 Scholarships opened on 1 July with a record number (39) high-quality applications. This year, six Scholars were selected, due to the selection of only four Scholars in 2016. The scholars represent dairy, sheep, beef and arable sectors. The Scholars are Nadine Porter (arable), Ryan O’Sullivan (dairy), Mat Hocken (dairy), Jason Rolfe (dairy/agri-business), Rebecca Hyde (sheep and beef) and David Kidd (beef). A two-day NZ and industry briefing. Reflective learning practices - to ensure Scholars are better equipped to understanding and link their overseas experiences and the implications for NZ. Linking research topics with the NZ agri-business agenda. Allocating research advisors to Scholars to assist with working on research topics and reports. The partnership with the Kellogg Rural Leadership Programme continues to be successful with the leadership pathway showing positive results. Three of our six 2017 Scholars have completed the Kellogg programme. Some notable successes on the global stage were celebrated in 2016. Craige Mackenzie (2008 Sch) a newly appointed Nuffield NZ Trustee, won the global 2016 Precision Agriculture Farmer of the Year Award and is driving some NZ initiatives with government. Richard Fowler (2016 Sch) was selected for Portrait Gallery of Innovative Farmers for the next SIMA Exhibition in Paris (two of only six represented). NZ is looking forward to hosting the Nuffield International 2020 Triennial Conference with a good contingent of Kiwis going over to the 2017 Triennial Conference in the UK to sell the highlights.